5 February is not a solidarity day, as claimed by Pakistan, but a fraud day. The sooner we understand this fraud, and the real game plan of Pakistan, the better it is for the people of Jammu and Kashmir. However, credit must be given to the Pakistani establishment for systematically and effectively fooling people of Jammu and Kashmir for long. A sad part of this drama, which Pakistan stages in name of Kashmir is that many people of Jammu and Kashmir still happily dance on the tune played by Islamabad, and regard Pakistan as a big brother and a well-wisher. What does Kashmir Day mean to the average Pakistani? Result of Online Polls by Dawn show that 85% of Pakistani’s do not believe in observing Kashmir Day. In a recent video tweeted by an ARY journalist, Former Cricketer Shahid Afridi appeared to suggest that Pakistan should allow Kashmir to be an independent country because Pakistan hadn’t been able to even manage its four provinces. “I say Pakistan doesn’t want Kashmir. Pakistan is having very serious financial problems, and in many parts of the country, their children and old and sick people are dying because of lack of medicine and food. However, their strong establishment has sufficient funds to arm, train, and launch militants across to commit acts of violence. Also, they have plenteous funds to spend lavishly on various false propaganda projects around the world to fool people of Jammu and Kashmir, and people of Pakistan. With this exercise, they think they are fooling the world about Jammu and Kashmir, and also advance their agenda on Kashmir. The reality, however, is that they are fooling no one, apart from themselves and their collaborators in Jammu and Kashmir. Diplomats and leaders of other countries are not fools. They know what the Pakistani game plan is, and no country take their propaganda seriously. Some even welcome this kind of activity, as that helps their economy. For example, if they hold a demonstration in Geneva, they have to transport day wagers from other countries. They have to pay them, for their food, transport and sometimes accommodation. Also, they have to provide massive funds to the organizers for publicity and banners which are displayed on streets. True sons of soil understand imperialist agenda of Pakistan and oppose it. 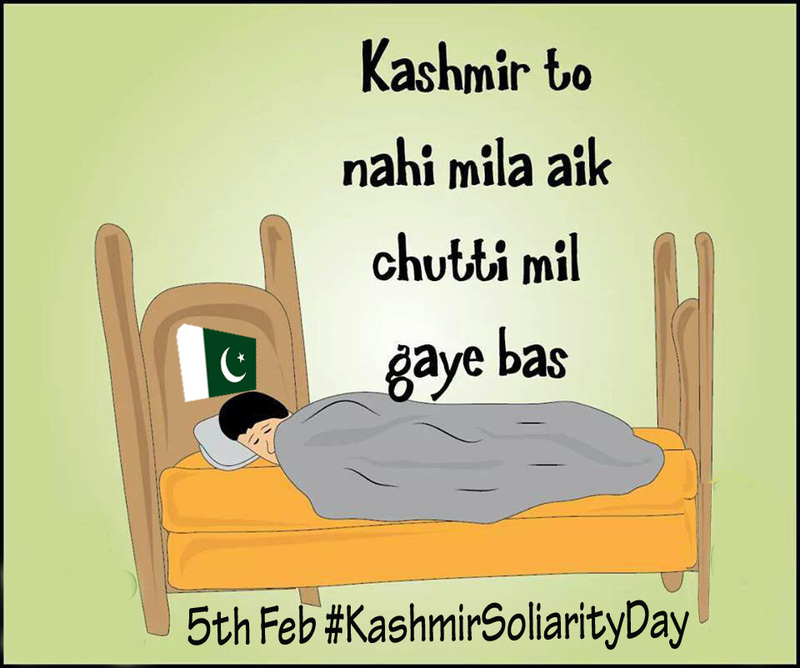 Some collaborators with hat of nationalism, on the other hand, say we should not oppose ‘solidarity day’, because Pakistan is the only country in the world that supports us. They don’t tell people that Pakistan is the only country that attacked us, despite a written agreement. India did not invade us, they came to Jammu and Kashmir after a written agreement, and on the request of the Maharaja of Jammu and Kashmir. They also don’t tell people how Pakistan oppress people, deny people their fundamental rights and exploit our resources in Gilgit Baltistan and in so-called Azad Kashmir. We can criticize India, and also condemn human rights abuses, as they have not fulfilled their pledges; but we cannot change historical facts to suit our political agenda. Every year well before December, the Pakistani establishment issues directions to their collaborators to prepare plans for the fake historic day- 5 February, which has no historical significance. This year is very important for them, as they have more problems in Pakistan in every aspect of social, political and economic life. Kashmir is the best topic which diverts the attention of the divided and suffering people away from their everyday problems. They will have another holiday in our name, and they will show on the national TV channels what their establishment is doing on the Kashmir front. For this purpose, the Foreign Minister of Pakistan is also ordered to take part in the fraud day function arranged in London. Of course, people like Barrister Sultan Mahmood and Chaudhry Yasin have already been instructed to mobilize their followers in England. Like, always, the High Commission of Pakistan will play a key role in the whole affair. The icing on the cake is the support of PTI people who are also enthusiastically taking part in this event. Honor their pledges assumed under the UNCIP Resolutions; and respect honor, dignity and fundamental rights of the people living under their control. Restore State Subject Laws, and repatriate all Pakistanis settled in Gilgit Baltistan. Release all political prisoners, and end schedule 4. Lift the ban on all the books and newspapers. Give an appropriate share of the CPEC projects to the people of Gilgit Baltistan and so-called Azad Kashmir. Stop exploitation of our natural resources and give control of dams to the local administrations. Instead of having a holiday in our name, work hard and give that money to victims and oppressed people on both sides of the divide. Hysterically, all government, semi-government offices, educational institutions, and corporations will remain closed in Pakistan on the pretext of Kashmir day. Last year February 5 fell on a Monday so government and private office employees were overjoyed to avail a long weekend. Kashmir as usual suffered another shutdown. At UN, Pakistan passes off Palestinian as a victim of atrocities in Kashmir. 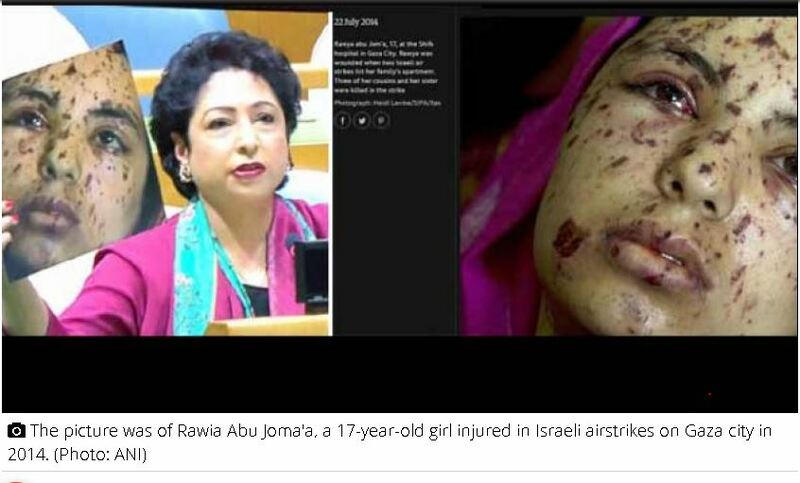 The picture used by Pakistan’s Ambassador to the UN was reported by a number of media outlets as that of Rawia Abu Joma’a, a 17-year-old girl injured in Israeli airstrikes on Gaza city in 2014. Rawia’s picture was taken by award-winning photographer Heidi Levine. The people of PoK are not happy with Pakistan and want to join India. Watch the analysis of how do people in PoK feel about joining India? Kashmir Day does not mean anything to the average Pakistani. The Kashmir dispute has become an unfortunate mockery in Pakistan whereby various shopkeepers, tired of their defaulting customers, strategically paste stickers around cash counters captioned “Kashmir ki azaadi tak udhaar bandh hay” (No credit until Kashmir is liberated). Kashmiri cries for freedom turned into our Schadenfreude. (German for a feeling of enjoyment which emanates from seeing or hearing about the troubles of others. Pakistan’s support and understanding of the Kashmir issue has become a ritual limited to February 5th, a lame excuse by the Pakistani lawmakers to enjoy their taxpayers money at the expense of Kashmiri sentiments.